Whilst People’s Choice is a national organisation, it is a great pleasure to have so many friends from the cooperative and mutual sector here this week in my home state and the location of our head office. 80% of our population is a member of at least one mutually-owned business. We have Australia’s largest customer-owned supermarket. We have the highest per capita number of members of customer-owned banks and credit unions – People’s Choice alone counts one in five South Australians as a member. We are certainly proud of this, but – as we have heard today – mutuality alone does not deliver business success. Emer Coleman’s keynote presentation this morning outlined how these changes are affecting society, not just business. But Emer made an excellent point: we have an opportunity to look beyond commercial concerns when we frame our response to these challenges. And it can be argued that the mutual sector has a competitive advantage in this respect. We need to build our strength on our shared core values. We need to rekindle the spirit that drove the birth of mutual enterprises so many years ago – the simple idea of people supporting one another to build a better future. In the financial services sector, we can easily state the benefits of mutuality – especially now – but disseminating that message, getting cut-through, is difficult. 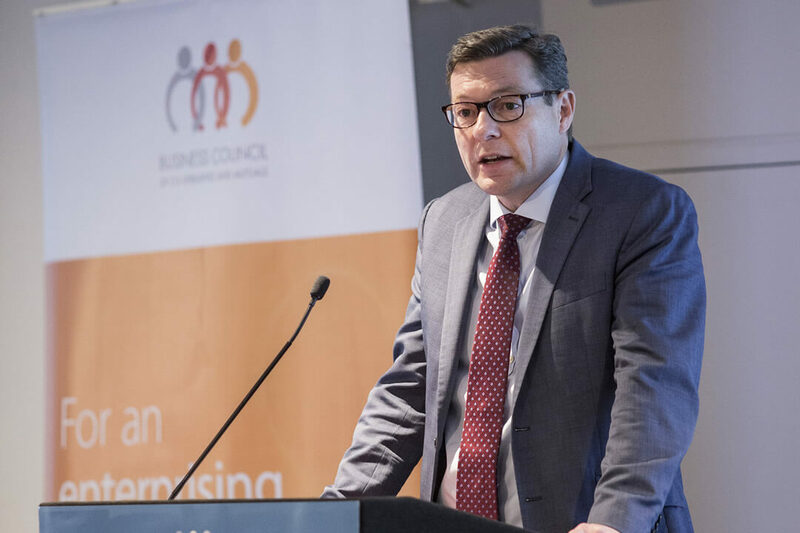 The Royal Commission into the Financial Services sector has raised this very issue and highlighted the key benefit of mutuality. The big four banks are listed entities. They have an overriding duty to maximise shareholder returns. But bank shareholders are not always the same people as bank customers, and that distinction has given rise to documented cases where greed and a drive for shareholder returns have been prioritised above customer service. As we know, the mutual structure is fundamentally different. Our members are both shareholders and customers. There is no conflict as faced by the major banks: we have to consider the needs of our members while also offering them the highest levels of service as our customers. Of course, that isn’t always easy. People’s Choice held its Annual General Meeting this morning. One of the major points of business was to update our Constitution to make it more flexible so we can react more quickly to changes in our business environment. Our role as business leaders of mutual organisations is to meet the needs of our members and to act in their long-term interests. Sometimes that takes time to outline and explain, but it is always a powerful position to take – this is for the benefit of a stronger organisation, to deliver more for our members both now and into the future. Those conversations seem to be missing from many exchanges across corporate Australia at present, and I believe that may be contributing to diminishing levels of trust. The mutual sector can play a big part in rebuilding that trust. It’s not a matter of highlighting the weaknesses of others – there’s certainly enough of that happening in many spheres at present. It’s a matter of playing to our strengths. And being proud of those strengths. There remains a pivotal question for mutuals and co-ops: do people actually care? It’s a good question, and one that’s not easily answered. Dr Guy Turnbull spoke at this morning’s Breakfast on the Hill about the opportunities the mutual model offers for health and aged care. He speaks of pushing aside the corporate model of health care to allow business owners – those previously considered employees, who are actually providing aged and health care services – to share the profits of the business in proportion to the amount they work in the business. New Zealand’s Fonterra is another case in point – a shared ownership model representing 10,000 dairy farmers, now a global business. It’s a different story within Australia’s financial sector. The major banks control well over 80% of the market. The excesses linked to the conflicts inherent in their corporate structure as revealed by the Royal Commission have not yet resulted in a mass exodus. We have seen some movement, especially in financial planning, but we cannot point to a pivotal shift of perception that consumers are now appreciating the benefit of a mutual model. That remains the key challenge for everyone here today and the organisations that champion the mutual model across Australia. Events like this Summit are vital for bringing the mutual sector together. We have the same commitment to the benefits and successes of our shared structure, and in most cases, the same challenges from the dominance of corporate entities. The question, then, about how we leverage the benefits of our structure is not a question that we should face alone, sitting around our board tables as we map out how our disparate businesses will both engage and manage the technological, economic and social challenges we face. On this one element – our mutuality – we can openly share our thoughts about turning our strength into something that builds all of our businesses. And that is something that we can all agree is of significant benefit to the thing we hold most important – our members and their needs. I’d like to thank Melina and her team at BCCM for giving us this opportunity to continue this discussion – and for challenging us to take it further. I certainly hope we can return in a year and point to the inroads we have made as businesses and as a mutual sector. Simply put, it’s the right time to start that process. Thank you very much, and I look forward to working with you all to that end.